One of those obvious, important, and hidden-in-plain-sight realizations dawned — or more accurately re-dawned — on me today. So, I'm sharing it with you now to get you in on the action, so to speak. While I was preparing some curated articles to post to BigSkyRise, I started to think about how much great information is already out there. People are sharing so many powerful stories, great insights, and answers to tough problems. That got me thinking a bit more about the state of people, society, and the world. With all those great answers out there already why aren’t people happier, more enlightened, healthier, more fulfilled? While some people still aren’t exposed to much of the information for a variety of reasons, for the most part the answer really comes down to one word: action. For many of us, we find ourselves unhappy, unsatisfied, and disconnected from the deep beauty and light of life. As a result, a significant portion of us go out and look for answers as to why that is, and what we can do about it. We collect, store, and accumulate information and answers. The problem is that we neglect the importance of action and rarely really act on the answers and information we find; at least in a committed fashion that can bring about real change. For some of us, we just keep looking for more answers feeling like if we just collect more we'll eventually be better off. We keep searching, keep reading, and keep adding to a list of answers we will try out “later”. For others of us, we stow away the answers and just plug back into social media, TV, or the latest game built to manipulate us through numerous psychological triggers. Rarely, if ever do we give the answers we find a chance to impact our lives in any meaningful way. Ultimately, the difference between success and failure, happiness and unhappiness, is found in the action we take, or don't take. Whether it’s changing your life with one simple thought, dealing with crab people, finding your way in life, rewriting your story to unlock your life, getting mindful meditation fundamentals down, or any other post on BigSkyRise or elsewhere, simply reading doesn’t do you that much good. If merely having knowledge, or being in the presence of it, was all it took, then everyone that has ever been to a library or used the internet should be enlightened, happy, and successful. I’d rather have you come, read one article, put it into action and never come back than to read every article here and not have it do you any good. My goal for BigSkyRise is to make a difference in your life, to make your life happier and more fulfilling, and to make the lives of many others — including my own — better too. It’s the primary reason I created this site, and it’s more important to me that you live a happier, more fulfilling life than it is for me to have some kind of huge readership. So, please, if you do nothing else, find one article that will make a difference to you and take action on it with intention, conviction, and commitment. By just taking a committed step on one thing, you will make your life better and any other changes you wish to make can come easier. 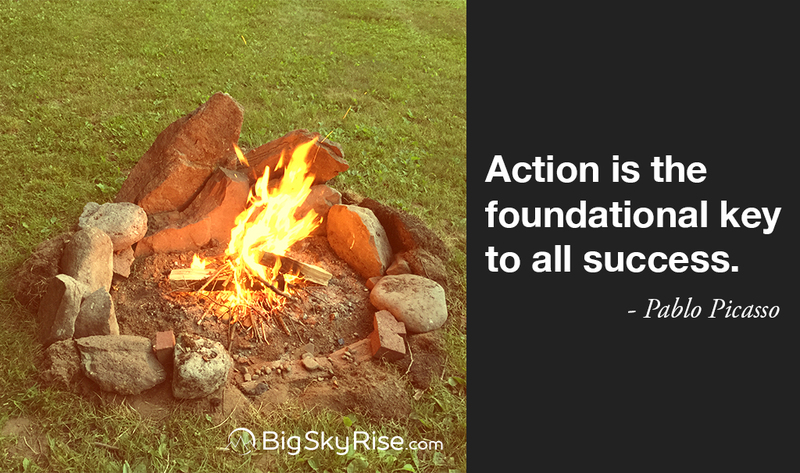 Once you take action on that one thing, and see how it can change your life in big ways, it makes it that much easier to commit to taking action on something else that can be a powerful catalyst for change. There’s already great knowledge out there, and you likely have some powerful answers to life’s problems tucked away in your head. Start taking action so that those answers and the great knowledge you’ve acquired can make a difference in your life and the lives of others. Acquisition of knowledge is simply a starting point. Acting on that knowledge makes the difference. Ask yourself how you can start taking action today. P.S. I completely understand the proclivity to collect information without actioning it. It’s one of many habits I too am in the process of working on correcting. P.P.S. Analytics Sidenote: In case you’re wondering, I use analytics to help me know I'm reaching people, what content seems to be the most helpful, and where I can do a better job on things. I have no intention of being creepy, ever sharing the information I collect, etc. Privacy is very important to me personally, so I work under the assumption that it is to you too. Take action by sharing this message with others so that they can start taking action themselves.